KIEV, Ukraine -- Ukrainian opposition leader Mikheil Saakashvili on Monday said an appeals court rejected his appeal for protection against possible extradition in a decision he said was politically motivated. 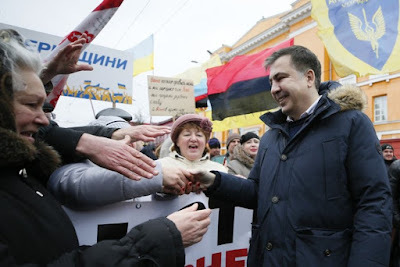 Ukrainian opposition figure and Georgian former President Mikheil Saakashvili (R) greets his supporters during a rally in Kiev, Ukraine February 4, 2018. The former president of Georgia entered Ukraine last September despite being stripped of his Ukrainian citizenship in a protracted standoff with the Kiev authorities, whom he accuses of corruption. He is wanted in Georgia on four charges including abuse of office, which he says are trumped up. The Ukrainian court upheld an earlier ruling to deny him the status of a person in need of additional protection. "This is yet another decision by (President Petro Poroshenko) and not by the court," Saakashvili said in a post on Facebook after the verdict. His lawyer, Ruslan Chernolutsky, said the ruling would likely pave the way for Saakashvili's departure from Ukraine. "We all need to be prepared for the fact that the authorities in an illegal manner will take the decision on his compulsory deportation or possible extradition," he said in a video posted by Saakashvili. In December, Ukrainian General Prosecutor Yuriy Lutsenko said Saakashvili was likely to be extradited. Saakashvili also faces criminal charges in Ukraine. The authorities accuse him of assisting a criminal organization, which he calls a fabricated allegation to undermine his campaign to unseat Poroshenko.